The HSO celebrates Leonard Bernstein’s centenary with his Slava! Overture and the fantastically catchy Symphonic Dances from West Side Story. 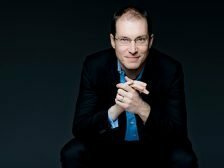 New York-based pianist Gilles Vonsattel, praised by the Miami Herald for his “dazzling technique,” plays Gershwin’s bluesy Piano Concerto in F. The program is rounded out by Stravinsky’s colorful Symphony in Three Movements, which recalls the rhythms of The Rite of Spring.